When will be Britain's Busiest Motorway next episode air date? Is Britain's Busiest Motorway renewed or cancelled? Where to countdown Britain's Busiest Motorway air dates? Is Britain's Busiest Motorway worth watching? Britain's Busiest Motorway is a six-part documentary series that goes behind the scenes with the hidden army of traffic controllers, patrol officers, engineers and maintenance workers who work tirelessly around the clock to keep the M25 motorway moving. In episode three, it's bank holiday weekend and with a heat wave on its way, there are record numbers of vehicles expected on the roads. As the big getaway begins, traffic officers Howard and Tim are called to a big pile up in heavy traffic. At junction 4 of the M20 a truck has hit a pedestrian bridge forcing it to collapse onto the carriageway. As a result, the M20 has to be closed - adding hours onto holiday makers' travel times - and for Highways England, it's a race against time to get the road re-opened before over a million holiday makers start their return journeys. For the maintenance teams, this means working through the night to get the bridge off the carriageway. In episode four, traffic officers Ray and Brian have been called to a truck v car collision. The car driver is unhurt and unfazed, but the truck driver is not happy. Meanwhile, traffic officer Simon and team manager Kevin find some illegally parked truck drivers on the side of the motorway and Kevin finds it hard to make himself understood. Nearly 30% of all traffic collisions on the M25 happen in wet weather. And in episode five, an unexpected thunderstorm has hit the region, dropping two weeks' worth of rain in just three hours. The huge amount of water has caused a flood at junction 21 covering one entire carriageway and Highways England are forced to shut the motorway. Fortunately, traffic officers Keith and Andy and team manager Kevin are on hand to deal with the situation. It's not only bad weather, which can cause problems on the motorway. Another unexpected problem is animals. They might look cute from the road when they are on the right side of the barrier, but when they're on the motorway they can cause mayhem. The M25 lies on the edge of London's green belt and with so much wildlife nearby, traffic officers need to know how to handle them. So today, Simon, Kevin and Andy are sent off for horse handling training, and they are not exactly filled with excitement about the prospect. But it's not long until Simon has to put his training into action when a horsebox breaks down in the middle of the motorway. In episode six, as traffic officers Andy and Keith clock on for the late shift, reports come in of a cupboard on the carriageway. Last year, there were more than 2000 call-outs to items in the road, which can pose an obvious risk to drivers. When they get to the location, it is clear that what was a cupboard is now debris spread across the carriageway. Removing debris is dangerous even in daylight, but with the speed of traffic increasing by over 10mph and visibility dramatically decreasing at night, after dark this job is even riskier. 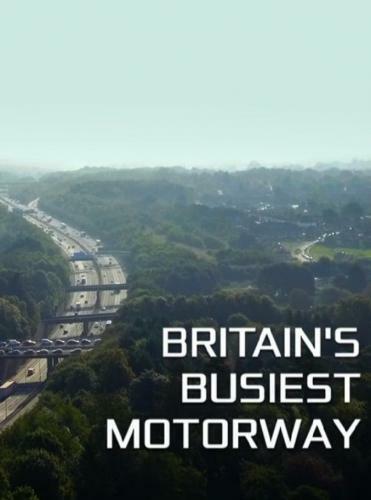 Britain's Busiest Motorway next episode air date provides TVMaze for you. EpisoDate.com is your TV show guide to Countdown Britain's Busiest Motorway Episode Air Dates and to stay in touch with Britain's Busiest Motorway next episode Air Date and your others favorite TV Shows. Add the shows you like to a "Watchlist" and let the site take it from there.